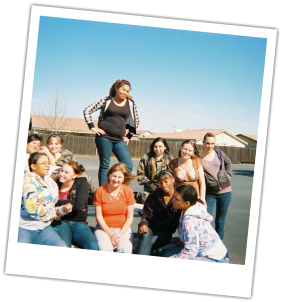 Synopsis: Dr. Nkechi Nzerem first learned about Mather Youth Academy (MYA) as a Pediatric Intern on her very first CHPT rotation in the Rancho Cordova community. With a previous background in mentoring young girls, Nkechi was both excited about this special school for youth struggling in mainstream schools, and concerned about the young women attending a boot-camp-style school with such a hard, masculine environment. When Nkechi came back in her 2nd year to begin planning her project, she knew she wanted to work with MYA, specifically their female students. Nkechi met with Rogeen Cortrite and other school staff to discuss what would be most beneficial for the young women. Ms. Cortrite wanted the girls to see Nkechi not just as a positive role model, but also have access to her knowledge about health. The only issue, Ms. Cortrite informed her, however, was that these young women were going to take a while to "warm up," and, due to its role as a disciplinary program, the population was not always stable. Partnering each young woman with a mentor was going to be an effort far to intensive for this kind of project. Rather than become discouraged, Dr. Nkechi discussed different mentoring approaches with Katie Wilse, the community's resident Mentoring expert. Katie introduced Nkechi to the concept of "group mentoring," where a gorup of mentors meet informally with a group of mentees regularly. While Nkechi wanted to be able to offer more to the students, she realized that she needed to be realistic if she wanted the project to succeed. Together with Ms. Cortrite and her CHPT Faculty Linda Burkholder, Nkechi crafted a plan to meet with the young women after school, once per month. She began recruiting female mentors from the community and worked with Ms. Wilse to conduct a training on group mentoring. As the group of mentors formed, they decided that they would like to share their hobbies and skills with the students, rather than just talk at them about their careers and education. They would take turns sharing a hobby or trade, during which the students could open up naturally while participating together with their mentoring group, in a fun activity. Nkechi worked with the local VISTA, Stacey Droll, to secure donations of snack and supplies for the first session, which was led by group mentor Liz Sterba, who showed the young women how to scrapbook their lives, memories and interests. The students loved the project and became eager to participate. While they initially didn't talk much to the mentors, as they saw these women come, month after month, learn new skills from them and hear about their careers, the young women started to develop relationships and talk more openly with the mentors. To see how Nkechi planned and implemented her project, view her Logic Model documents below.